Do you have great handwriting? Do all you friends marvel at how beautiful your ability to pen a quick note? Do you enjoy or like calligraphy? Then you can make money simply with a pen, blanks cards and time. Have you ever thought of charging people for handwritten "Thank You" cards? Or handwritten "anything"? There are people (and businesses) that find a need for handwritten products. There are articles upon articles written about CEOs and business owners garnering great success because they took the time out to send handwritten notes to their staff and clients. Simply Google "business" and "handwritten notes" to get a list of these articles. Why has the handwritten thank you note become rare? Because in this business word of computers and smartphones, we've lost the art of beautiful handwriting and we don't have enough time to sit down and thoughtfully create a nice and personal sentiment. So, if you have great handwriting and a flair for writing a personal note, you may have an ability to help someone and make money doing it. The top business that needs handwritten services would be the Wedding Industry. Brides and Grooms need someone with beautiful handwriting for their . . .
All you must do is go wherever the Bride and Wedding Planners go . . . cough - PINTEREST - cough and display your ability with examples of envelopes address, thank you cards written and wedding cards scribed. Let them know how much per card you would charge and watch the orders roll in. Older people still wait for mail. That's what one rural mail courier told me one time. He said it was said to watch older folks waiting at the mail box -- waiting for letters that will never come. They don't use computers, or pads or have smart phones. They don't have e-mail. They still value a written letter that they can hold and read and store for safekeeping. Do you have family and friends that have older folks that would like to receive a note or two from their loved one? You can provide that service for your friends! I know a teenaged girl with great penmanship who copies jokes and interesting information from e-mail or Facebook from her friends. Adds a note and sends it to her friends elderly family member once a month. She charges $10 a month for the service. She has 10 clients. She says she's on Facebook following these people anyway, and this way they get to share with friends and family that are not Internet connected. It's a great little service and everyone seems happy about it. "I have new grandparents and uncles and aunts out of this," she said, "plus, I make like $100 a month and I could make more if I didn't have school." But, I don't know how to write thank you notes! Wow, so the ideas are endless right? And say, you do have beautiful handwriting but you have no experience actually writing thank you notes. Here are some resources that teach you this fine art. Here are some fun thank you notes by famous people just to get you started. This can be done! Don't believe that people are actually making money writing thank you cards for people? 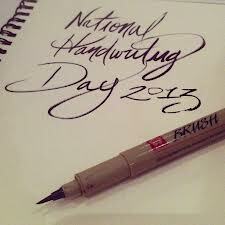 Take a look at this Handwriting Service: Hand Written Docs - http://www.handwrittendocs.com. See? It can be done. And just think, with your efforts in the handwritten note business you may very well save the United States Post Office -- you hero you! I enjoyed this article very much. I think letters are becoming the next telegram. We won't have handwritten love letters, letters from famous people, or documents for our museums. Thank you notes are hardly ever written or received. Kids today think everything has to come from a computer. I'm glad you appreciated it. My kids have gotten EVIDENCE of the power of the thank you letter when I made them sit down and thank people for their contributions all through their teenage years. Now, as they are embarking into adulthood, they are realizing that people REMEMBER them and what to HELP them and provide all kinds of OPPORTUNITIES for them -- because of those thank you notes. I'm really glad I can provide my readers with ways that THEY can benefit from writing thank you notes. I so appreciate that you took the time to comment and let me know that I hit the mark with this article. I appreciate you! i interesting with several artcle in this blog,, why not update again?